I recently spent some time in the Netherlands, including a night at the Zerofield campsite (google translation). As I was about to start prepping my evening meal à la headtorch, one of the proprietors came over to say hello and conversation rapidly descended (ascended?) into bike nerdery. I was invited to see his bike shed the following morning and naturally I accepted! 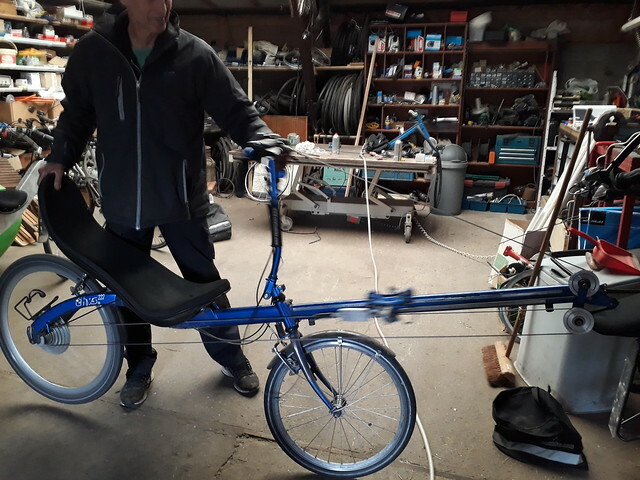 So, it turns out one of the owners of the campsite is Wim van den Assum, long-standing member of the Dutch Association for Human Powered Vehicles (NVHPV) and former world championship title holder. I can't find the exact title online, so I won't guess but, suffice to say, he's into recumbents. 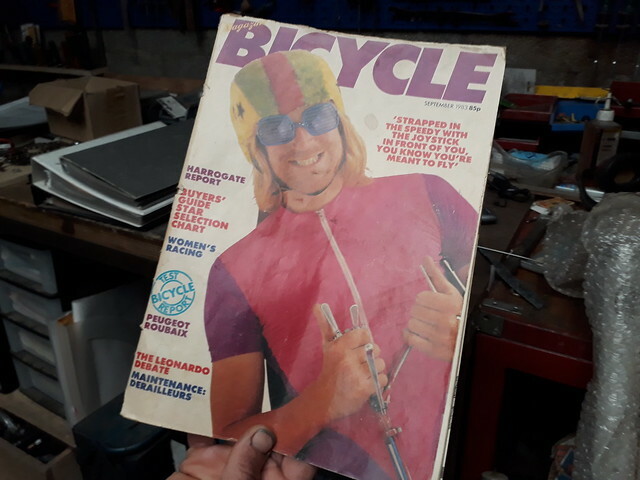 Wim also has a good collection of magazines and photos from The Olden Days. 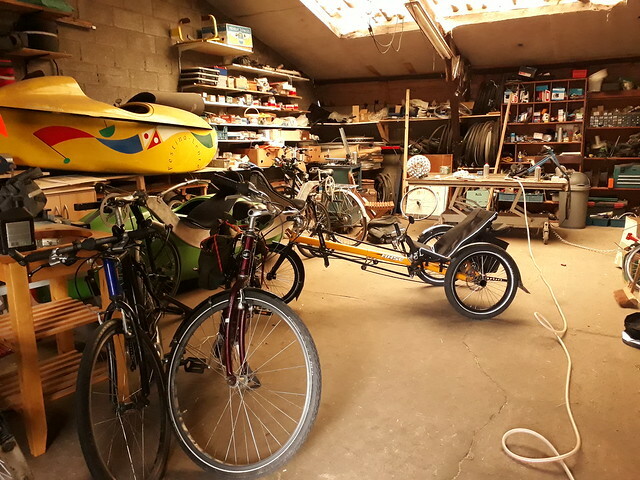 So if you're at all interested in recumbents, cycle design in general, or just good ol' tinkering in sheds, then I whole-heartedly recommend you stay over at Zerofield! (camping, yurts or B&B). I think that has ascended way beyond nerdery into the highest stratosphere of geekdom. I think it would be fair to call it a barn. Trying to understand the gearing on the rower did my head in. I've spent some quality time contemplating it between races, and even had the mechanism explained to me, and I'm still not sure it isn't witchcraft. Riding alongside one is weird too. Delighted to the 'Harrogate Report' featuring prominently on the magazine cover! Great mag, I had that issue for years. 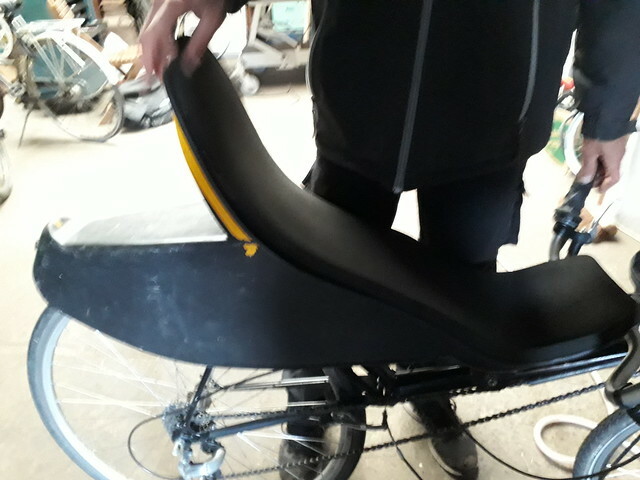 It was the first time I'd read anything sizeable about recumbents. 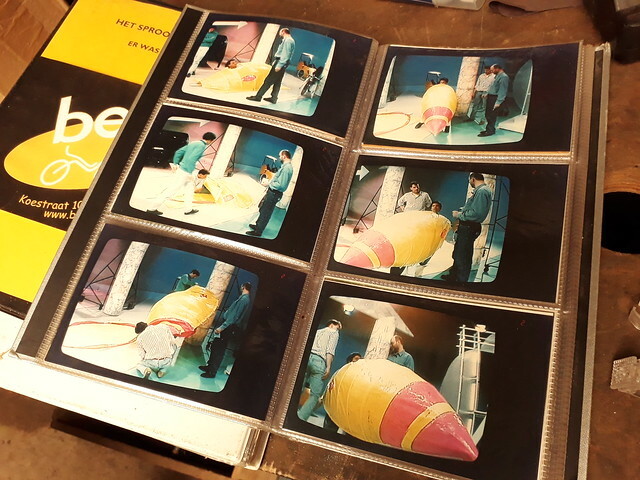 A few years later, I got to ride a very early LH drive Speedy. I've still got that one! And I probably rode the same Speedy as well. Meaning the drive chain was on the left-hand side? 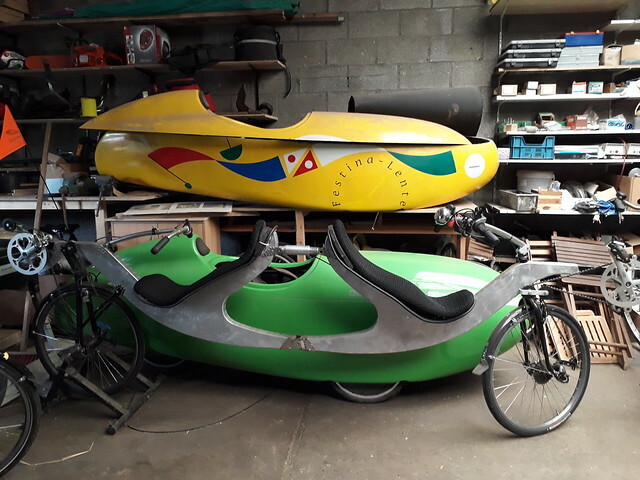 I remember seeing a back to back recumbent tandem when I was there last year, but at a passing distance. How do they work ? 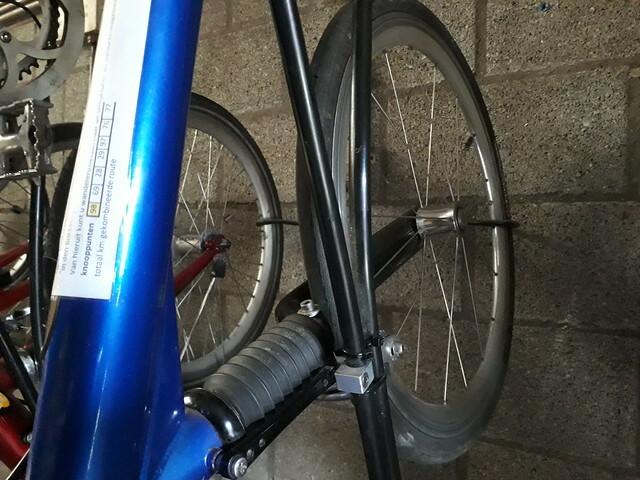 The LH drive Speedy had the cassette on the LH side of the frame, making the rear wheel even more offset than 'normal'. The chainrings were similarly on the left (tandem cranks?) 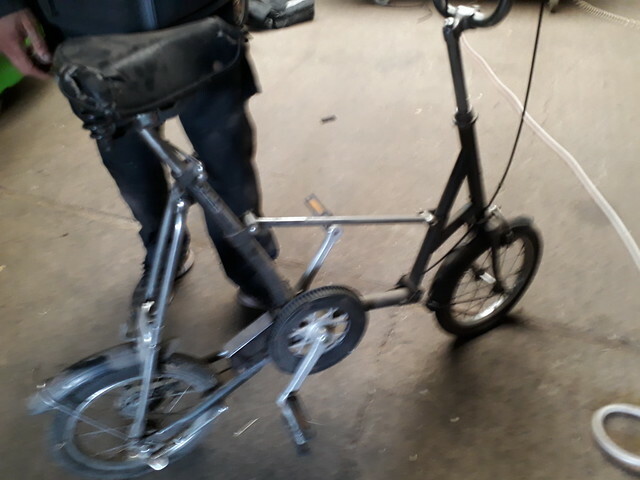 and Mike had to fabricate a funny-looking front derailleur to suit. 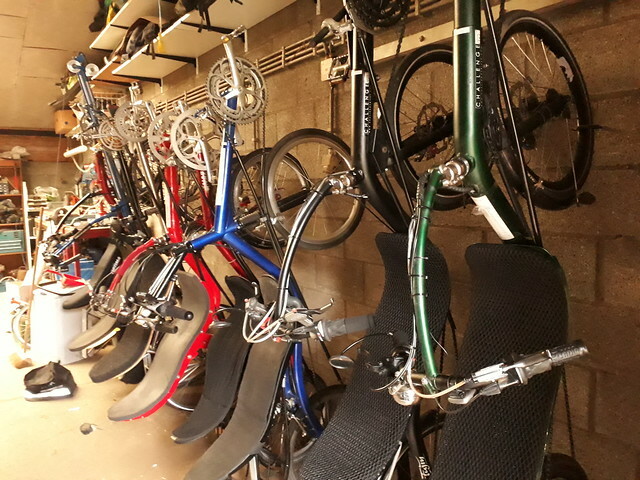 That back-to-back tandem has completely independent drivetrains but the stoker's tension and return chainlines cross at the idlers, letting them pedal forwards (for them) but backwards relative to direction of travel. 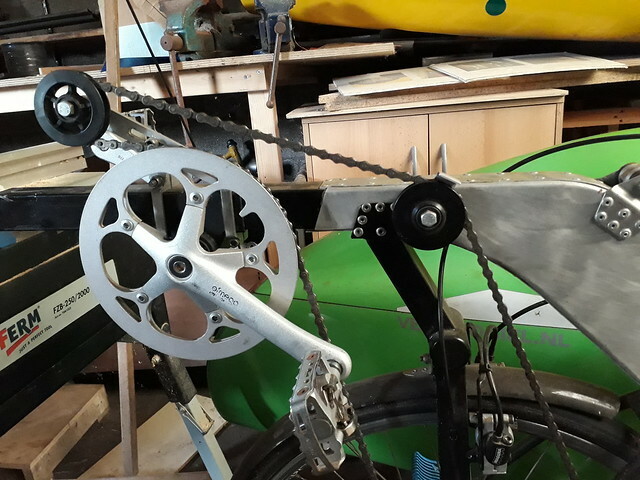 the stoker's tension and return chainlines cross at the idlers, letting them pedal forwards (for them) but backwards relative to direction of travel.